Manet met his future wife, Suzanne Leenhoff, in 1850, when she arrived in his parents’ household as a piano teacher. Before their marriage, Suzanne served as the model for Manet’s first history painting, and she continued through the succeeding decades to sit for private portraits like this one, painted in the mid-1870s. Capturing the quiet beauty and famously even temper of its subject, this picture also demonstrates a new freshness and informality of handling: Manet’s response to the emerging Impressionist style, particularly the work of Berthe Morisot. 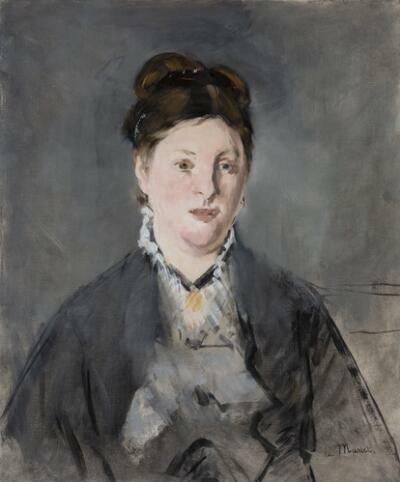 In this portrait of his wife, Édouard Manet suggests his interest in fashion and his commitment to portraiture. The warm, creamy tones of Suzanne Leenhoff’s face are magnificently rendered against the muted, non-descript background. Her chest and gently sloping shoulders are evoked with a few bold brushstrokes. The embellished black comb, headband, necklace and ruffled collar all reflect Manet’s sustained attention to the details of a woman’s toilette, even in a rapidly sketched portrait such as this. To hear more about that relationship, press 3281.